The ex-FC Barcelona first team player and the current FCBLegend, Juliano Belletti, visited the FCBEscola camp in Miami this morning ahead of the third and last International Champions Cup match. 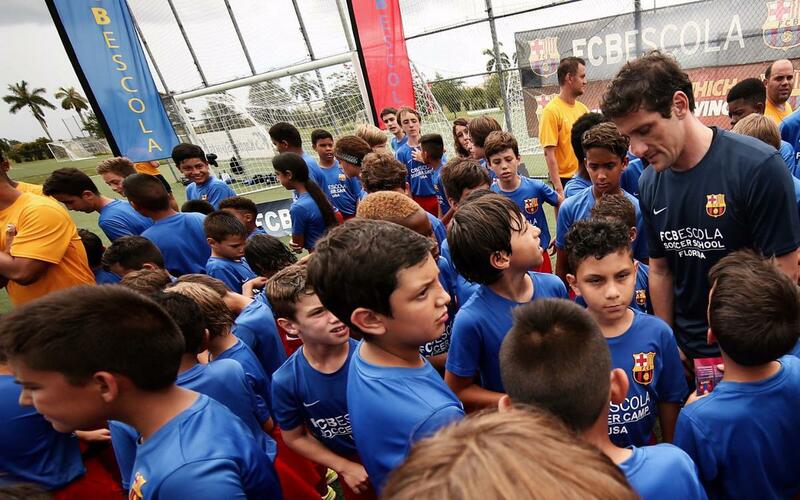 The rain and thunderstorms didn’t ruin the event which was attended by 250 boys and girls from the FCBCamp. The young participants waited for Belletti’s arrival alongside the Director of the Local Project for FCBEscola Florida, Micky Castiella, in the building and when he got out the car they started singing his name. The Brazilian star was accompanied by the Club Director Enric Tombas; FC Barcelona’s CEO, Òscar Grau; and the Director of the FCBEscola project, Franc Carbó. Belletti and Tombas spoke to the children on arrival. After, the guests were presented with an FCBEscola Florida shirt with their names on it. Tombas’ had the number ‘1’ while Belletti and Grau both had the number ‘2’ they wore with distinction during their career. The rain prevented Belletti from taking part in a training session with the youngsters but theday finished with an autograph signing session and a commemorative group photo of thevisit. On the same day, the school players visited the stadium to watch the first team train ahead of the FC Barcelona v Real Madrid match.